Eidos Montreal has released a 25-minute-long video of its full Deus Ex: Mankind Divided demo from E3. 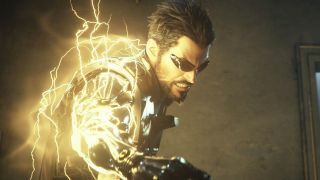 The video, narrated by Executive Audio Director Steve Szczepkowski, sees hero Adam Jensen arriving, apparently undercover, at a busy train platform, where he meets a contact, has a conversation, and encounters the oppressive tools of the new regime. Trouble ensues, as it so often does, after which Jensen catches a quick plane ride elsewhere and then hops into action. "In the previous Deus Ex: Human Revolution, we knew that our combat pillar wasn't quite on par with the stealth one," Szczepkowski says. "This time around, we've put a lot of effort and energy into making the combat pillar as visceral, rich, and as fun of an option to play as the stealth one." Be warned: The YouTube description says, in all caps, that there's a "spoiler scene" between 18:25 and 22:20, so you might want to skip that segment if you don't want to know what's coming. Deus Ex: Mankind Divided is expected to be out in early 2016.